The October decline has taken the S&P 500 right to the edge of breaking the uptrend from February 2016. The market is riding the line between a fairly routine reset in valuations and expectations, and a deeper rout that would challenge the consensus assumption of solid U.S. economic growth moderating benignly next year. Jason Hunter, technical strategist at J.P. Morgan, says he continues to view the drop as "as a late-cycle correction and not the start of a bear market." The recent stock market action is of no real help in determining whether this is a painful but brief correction or the opening phase of a longer, deeper downturn. The oppressive selling interrupted by flawed and fleeting rallies, the widespread damage to the majority of stocks far exceeding the S&P 500 index's 9.8 percent drop, the refusal of investors to take heart in cosmetically upbeat corporate results — all of it is equally plausible as a passing scare or an ominous emergence of the bear. The uptrend in the S&P 500 since February 2016 is now bending or cracking, depending on the interpretation. That February 2016 low was the end of a "stealth bear market" that gouged some 12 percent from the S&P 500 while inflicting worse damage on industrial stocks and foreign indexes — on multiple waves over the course of six months. 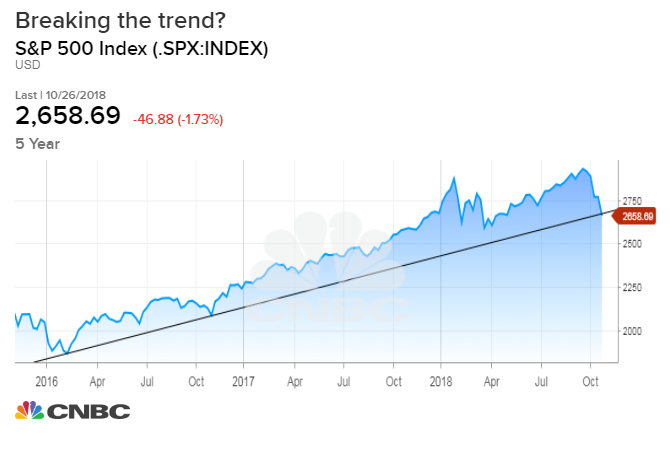 The Nasdaq-100 index — a proxy for the mega-cap growth stocks that carried the market until they faltered recently — is sitting on an even longer uptrend line from the March 2009 low. The carnage has been pretty comprehensive: More than three-quarters of all S&P 500 stocks are down more than 10 percent, and nearly half are at least 20 percent off their high. In the broader S&P 1500 index, a majority of stocks has lost at least a fifth of their value. Other ways of viewing the market also show it to be flashing "oversold" extremes, including Daily Sentiment Index readings for the S&P 500 that got below 10 percent last week, a sign that fear had replaced hope for more than 90 percent of tactical traders. To be clear, oversold doesn't mean "at the bottom" — not to be alarmist, but crashes occur from oversold levels in the rare occasions when they strike. Yet these readings do show that the retrenchment has been happening for a while and it is pretty far along, at least for the short term. In a way, this means that whether this ends up being called a correction or the initial assault of a more serious bear market isn't terribly crucial right away. Because in either case, the market would probably bounce, quite violently, before long from near current levels or perhaps after another scary whoosh lower. Other statistical gauges of downside velocity Friday reached levels seen only a few times in recent years: At the August 2015 low following the China devaluation; at that February 2016 bottom; and this past February. All came ahead of sharp rebounds, though the market fell back weeks or months afterward before recovering fully. Jason Hunter, technical strategist at J.P. Morgan, says he continues to view the drop as "as a late-cycle correction and not the start of a bear market." Yet "even if this proves to be the start of a more aggressive bear market, the set of conditions that exists often resulted in multi-week rebound during the 2000-2003 and 2007-2009" bear markets. Deutsche Bank strategist Binky Chadha has a model to derive the economic expectations embedded in the S&P 500 relative to its 200-day average. Right now, he says, " The S&P 500 is currently pricing in an ISM of 50 [manufacturing neither expanding nor contracting] or economic stagnation, and similarly earnings growth of zero." Chadha thinks those market-implied forecasts are too pessimistic. The market certainly has been bracing for some kind of "growth scare," given the profound weakness in housing, auto and financial stocks. The nasty declines in shares of companies exceeding earnings forecasts show an acute sensitivity to any sign that economic activity has been "pulled forward" and will fall away quickly. If this is simply the market flinching in advance of a feared economic blow or aggressive Federal Reserve rate-hiking campaign that doesn't arrive in coming months, then many of the most beaten-down cyclical stocks will probably prove cheap after the recent skid. "Late-cycle anxiety" pervades every market debate. Back in the February market tumble, I and others argued that such a sharp, sudden spill from a high-momentum peak is not typically how bull markets end. But the decline since September — after a grinding, narrowly led push to a marginal new record high — does fit the classic pattern of an important top better. Last month I noted that the market was betting too heavily on tech, and four weeks ago made the case that the bears had a good chance to score some downside points. But those views did not nearly foretell the painful pace and degree of decline of recent weeks, and were presented in the context of a bull market trend that still deserved the benefit of the doubt. That's a bit less clear now. Credit markets have softened but not yet alarmingly, and other leading indicators of the economy are holding up fine. Yes, as BTIG strategist Julian Emanuel notes, "every recession since 1990 has been preceded by an equity market top and subsequent bear market." But the stock market more often has panic attacks that don't end up as prescient warnings of pain in the real economy. Emanuel says only one of his "economic canaries" looks unwell: The cumulative stock advance-decline gauge has undercut its 200-day average for the first time since 2016. But he's sticking with the idea for now that this is a buyable correction, at prices down to the February lows in the S&P 500. The 2014 market example cited here from time to time is still theoretically in play: A nasty October correction that cost the S&P its entire year-to-date gain amid Fed-tightening fears and a wild-card Ebola scare, followed by a violent reversal higher into December. But at this point, that has to be considered just about a best-case result among a widening and worrying range of outcomes.